Two new studies say the variability of Earth’s climate declined when glaciers in the Northern Hemisphere retreated about 20,000 years ago — a finding that will help researchers better understand climate change today. The climate just doesn’t swing like it used to. A pair of studies examining the prevailing temperatures found a marked decline in the long-term variability of Earth’s climate since the great glaciers retreated more than 20,000 years ago. Those swings, which took place over centuries, may have affected how and where humans were able to settle down — and might help improve our understanding of today’s climate changes. One study, led by scientists at Germany’s Alfred Wegener Institute, concludes the shifting of climate patterns occurred far more often and diminished far more extensively in the area around Greenland than in the lower latitudes. The other, led by researchers at the University of Colorado, linked the decline of the North American ice sheet to changes in atmospheric circulation that caused changes all the way to Antarctica. Both studies were published February 5 in the research journal Nature. Since the last ice age peaked about 21,000 years ago, average global temperatures have risen between 3 and 8 degrees Celsius (5.4 to 14.4 degrees Fahrenheit). The warming wasn’t always steady. It waxed and waned over hundreds, if not thousands, of years. 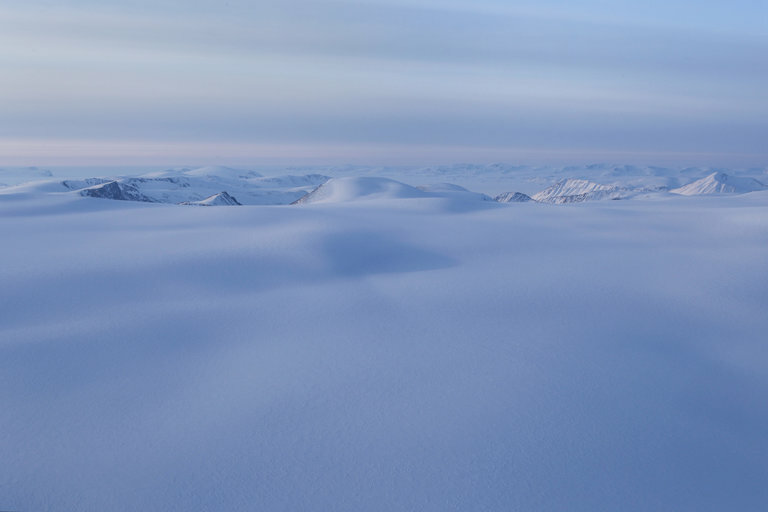 To track those changes, Wegener paleoclimatologist Kira Rehfeld and her colleagues studied core samples taken from the Greenland ice sheet, which is nearly two miles thick in places. Scientists compare the amount of a heavier oxygen isotope, oxygen-18, to the more common oxygen-16 in the ice to reconstruct temperatures. The more oxygen-18 is in the mix, the warmer the climate was at the time. They also looked at core samples from the sea floors across the world ocean, where fossil remains in the mud point to changes in ocean temperatures, and from inland lakes in Europe, Africa, China, and North America. The three-and-a-half-year study found that the ice had largely retreated, the amount of variability in climate worldwide dropped to about a quarter of what it had been before. Rehfeld compared the likely results of these variations to the effects of the Little Ice Age, a roughly 200-year cold snap that ended around 1800. The decline was more pronounced in the higher latitudes, and particularly in Greenland, where variability has declined more than 70-fold. That would have made it more difficult for humans to settle down and form the communities that led to today’s civilization. But Rehfeld said similar oscillations don’t appear to have occurred as often in other places. She suggested a shrinking difference in temperatures between the high latitudes and the tropics over thousands of years may be why variability has gone down. Today, climate seems only to be moving in one direction — toward a warmer globe. The Arctic in particular is warming twice as fast as the planet as a whole, further shrinking the differences between polar and tropical temperatures. The difference today, however, is the current upswing is man-made, caused by human emissions of carbon dioxide and other heat-trapping gases. Climate variability is “a key part of how you transition out of an ice age,” Texas A&M atmospheric scientist Andrew Dessler told Seeker. Knowing how climate might have fluctuated in the past can help scientists determine whether any of today’s warming is the result of natural forces, Dessler said. The last ice age saw glaciers covering most of the British Isles and Scandinavia and much of northern Europe. In North America, they reached south of present-day Chicago, gouging out the Great Lakes in the process. The ice reached a height of several miles, and their retreat affected climate as far south as Antarctica, Tyler Jones, a geochemist at the University of Colorado’s Institute of Arctic and Alpine Research, told Seeker. Core samples taken from the West Antarctic Ice Sheet hold a 30,000-year temperature record. Jones and his colleagues used a laser spectroscope to analyze those core samples for signs of change, comparing the pattern they found to the pattern of radio waves on an oscilloscope. The results support previous work that indicates large shifts in climate can carry long distances through atmospheric patterns without changing how the oceans circulate, he said. Dessler said climate variability studies like these could help improve computer models used to project Earth’s climate into the future.